Where: Santos Stadium, Railway Terrace, Mile End. A place in the semi-finals of the South Australian leg of Westfield FFA Cup qualifying is on the line as Adelaide Comets welcome Adelaide Blue Eagles to Santos Stadium on Saturday afternoon. Blue Eagles will be looking for their first Cup finals berth since 2011 where they lost on penalties to Western Strikers, while Comets have their sights set on their maiden appearance in a Cup final. 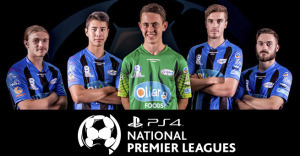 In the Round of 16, the home side easily took care of business against State League 2 side Fulham United, while Blue Eagles progressed at the expense of last year’s runners-up Adelaide City. City has a reputation of being Cup specialists, holding the record for most titles with 16. Despite this, Blue Eagles’ Marco Balsamo does not believe that the Marden based club are now the team to beat in the competition. It has been six years since Blue Eagles last won the Cup, but Balsamo said that won’t change the way his side approaches the game, despite it being within touching distance. “We’re always aiming for silverware and our past few cup campaigns have been disappointing. “Making a strong tilt for the Cup this year is definitely something we’re aiming to do. Having been a part of the MetroStars side which took out the National Premier Leagues Grand Final in 2014, Comets’ Steven Grelli knows what is needed for a successful Cup run. Comets shipped 4 last week against Grelli’s former side MetroStars, but he believes the side can bounce back this week and progress to the semi-finals. “Last week, although we weren’t at our best, the score line wasn’t a clear indication of the way we played. “We are confident we can bounce back. Grelli said that winning the Cup was a goal for his side at the beginning of the season, and that remains the case. “Our goal at the start of the year was to win the Cup and this has not changed.